Rangers center Brian Boyle hails from Hingham, Massachusetts, and he roots for the New England Patriots. He was pretty confident about the Super Bowl, too, telling the Times beforehand that "Tom Brady will hit Gronk in the end zone in the final minute for our fourth Super Bowl." As you may have heard, that did not happen, and the photo you see here — tweeted out by Brandon Prust — is the result of a lost bet. Add the grumpy look on this Pats fan's face to the list of reasons it's fun to be a Giants fan right now. There's video, too. 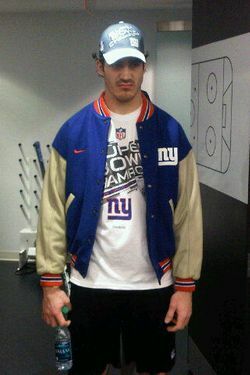 Said the good-sport Boyle: "I'll wear this hat, and that terrible shirt, but I don't have to be happy about it. I'm not going to put a smile on my face." A smile on his face? No. A smile on the faces of Giants fans? Yep.